64-bit version is available for separate download. See Patches. Water reflections are broken on Windows Vista and later. Use SilentPatch on modern systems. Crymods - Active community website with extensive mod database. 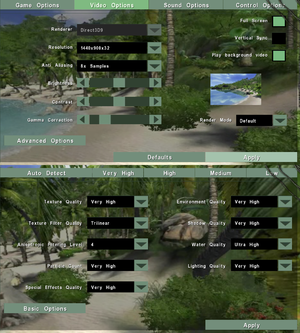 Far Cry Addon Mod (FCAM) - Various improvements to graphical and gameplay elements. 64-bit Upgrade Patch - Upgrades the game to take advantage of 64-bit architectures, allowing for higher frame rates and other optimizations. 64-bit Enhanced Content Patch - Adds exclusive features such as higher resolution textures and objects as well as increased viewing distances in some cases. Replace the files Crytek.bik, sandbox.bik, and Ubi.bik with empty files. The 64-bit patch will change the file format from .bik to .avi. To skip them delete or rename new files with the inclusion of AMD64. Extract the contents of SilentPatchFarCry.zip to <path-to-game>. Vert-. 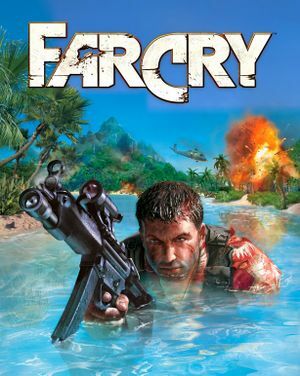 Use Far Cry Widescreen Fix. 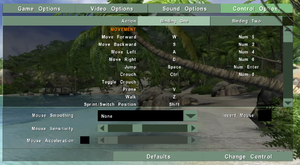 Use Far Cry Widescreen Fix while in windowed mode. Both mouse acceleration and mouse smoothing. Options go up to 5.1, but outputs to up to 7.0 speaker configurations. May require DirectSound 3D restoration software. Only available in the retail version. See here for the Steam version translation. After applying the 64-bit Enhanced Content Patch, the mountain rock textures appear extremely blurry in-game. TweakGuides has created a comprehensive guide for fixing issues in this game. It can be found here. Open system.cfg with your text editor of choice. Launch the game and set the Lighting Quality option to Very High. Alternatively you can just set the option to a maximum of High instead of Very High to resolve the issue. Reflections on water are broken by default in Windows Vista and higher. Foliage and other objects are reflected, but landmasses are missing altogether. 2 Experimental renderer. Cannot be selected via in-game options. See Enable the OpenGL renderer. Needs to be downloaded separately. See Patches. 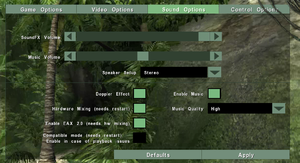 Open system.cfg with Notepad or other text editor. Change the value of r_driver to "OpenGL"
Save the file and launch the game. Windows ME, while it can work with Far Cry, is not supported. ↑ 3.0 3.1 File/folder structure within this directory reflects the path(s) listed for Windows and/or Steam game data (use Wine regedit to access Windows registry paths). Games with Steam Cloud support may store data in ~/.steam/steam/userdata/<user-id>/13520/ in addition to or instead of this directory. The app ID (13520) may differ in some cases. Treat backslashes as forward slashes. See the glossary page for details. This page was last edited on 12 March 2019, at 00:00.